Shopping on Black Friday isn't for the faint of heart, so get prepared. Black Friday is the most competitive selling day of the year, so it makes sense that it's also one of the busiest days to shop. 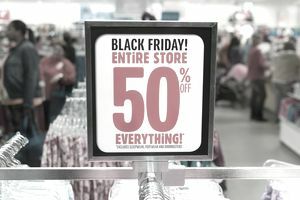 There are so many Black Friday deals, special sales hours and doorbusters that it can overwhelm even the most seasoned shoppers. But it's a day of challenge for bargain hunters, with one major goal driving them — to snag huge discounts on great products before everything sells out. These insider tips explain how they manage it. Your local Thanksgiving Day newspaper will be stuffed like a Thanksgiving turkey with ads, coupons, and circulars. This is a major source for local Black Friday savings so don't toss it aside as you head for the kitchen. It will also help you organize your day to maximize savings because many stores offer special discounts that are time-specific, such as early bird sales and doorbusters. Many Android and iOS apps are designed to make shopping for the best deals on Black Friday even easier. They can help you find the best place to park at the mall or even the best, least-trafficked route to stores. They'll alert you when the stores you want to visit have coupons and special deals available, and they'll help you compare prices while you shop. Get your research out of the way as soon as possible if you're hoping to scoop up a deal on a big-ticket item during the Black Friday sales. A bad product is a bad deal no matter how cheap it is, and being knowledgeable about the items you want to buy will help you avoid being sucker-punched with loud advertising for iffy deals. Use price-comparison internet shopping sites like PriceGrabber.com to assist you in comparing product prices. Compare the "options" included with the product. Some retailers will lowball an advertised price on a stripped-down product and then charge you extra for the necessary parts that will make it perform as expected. A good example of this is super low-priced computer printers that come without the cable or printer ink. It used to be that the early-bird shopper would get all the best worms on Black Friday, but now some stores open on Thanksgiving. They'll often advertise doorbuster prices, and there are also midnight madness sales and early-bird specials. Check the list of stores for holiday hours so you don't miss a good deal. Also, find out which malls in your area are giving out mall gift certificates based on how much you spend there. This can add up to significant savings if you do a lot of your shopping at the same center. Knowing when the stores are having their biggest sales and comparing prices on the things that you want to buy will allow you to come up with a strategy as to where to shop first. Prioritize the stores you don't want to miss going to so you don't miss a good deal. Most malls and shopping centers have center maps on their websites. Checking them can tell you where to park, which entrance to use to access your top stores, which stores are located close to each other, and the best routes to take. Internet shoppers can shop online in the pre-dawn hours of Black Friday. Many retailers will post Black Friday specials that can be ordered online and picked up at your local store. Special "web only" deals will also be available starting as early as Thanksgiving day. Many stores offer a "lowest price" guarantee, but you might be required to produce proof of the exact product that's being advertised for less. Take any print ads you've saved with you. Most local retailers won't meet internet prices even when the product is advertised on the same company's website, but it can't hurt to try. Print the web page that details the product and shows the advertised price. It might give you additional bargaining power and push the salesperson into waiving other charges such as assembly fees. You might find that even stores that usually offer guarantees on having the lowest price won't do it on doorbuster and early-bird specials. Knowing a store's policy on returns can help you determine where to buy. A previous trend of extending "return days" during the holidays is being seen less and less these days. Many retailers are including restocking fees and shorter return deadlines. Almost all the major retail chains have clamped down on requiring receipts for returns and exchanges, and many keep a database of individuals who tend to abuse return policies. If you get onto an "abuse" list, prepare to be turned down. Gift receipts generally include a description of the item purchased but not what you paid for the item. Including these receipts inside gift boxes will make returns or exchanges easier for the gift recipient. The recipient might be turned down for returning or exchanging the item without proof of purchase, or could risk receiving an exchange for the current selling price of the item. There's obviously no bargain to be had in running up high credit card bills and paying big interest rates after the holidays, but using the right charge card can be of value to consumers when they have proper spending disciplines intact. Many credit card companies entice consumers with free benefits, including free warranties, return protection, and sale price protection. Warranty Coverage: Your credit card company might offer to double or triple a manufacturer's warranty for free on a product you purchase — a good option instead of purchasing a service contract that costs money and has a shorter duration period. Return Protection: A credit card firm could guarantee a refund on a product for up to 90 days while the store might not. This is becoming particularly more important as retailers stiffen the allotted return days. Sale Price Protection: Some credit card companies offer this protection and will refund you the difference if a product you buy is marked down further than the price you paid within a certain time frame, usually 60 days. The enormous amount of holiday advertising, both locally and online, can be confusing and nearly paralyzing to the average Black Friday bargain hunter. Maximize the benefits of hitting the stores on a day when there are big crowds and better deals around every corner. Develop a plan and do some preliminary research. It will help ensure that your Black Friday is a shopping success. Have fun saving money while you shop! When It Is Best to Shop Online and When It Is Not? What Are the Specifics of Target's One-Year Return Policy?